My wife Colleen and I recently arrived back home after a 5 week trip to Europe to visit friends in Spain, Italy, and Germany. 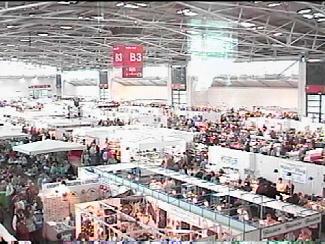 The trip culminated with a 3 day visit to the Munich Show from October 29th through the 31st. For those who have never been to Munich and hope to go some day I can only say start getting in shape now. The show is without question the largest gathering of rock related stuff in a single locale in the world. The Tucson "Event" is larger overall but is spread out all over the Tucson area. 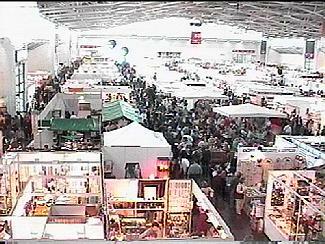 The Munich Show is contained in three converted airplane hangers from the old airport east of town. Each hanger is larger than the main convention center in Tucson at the main show there so you can sort of get an idea - three main Tucson Shows in one! Literally hundreds of dealers and tens of thousands of attendees. It is a VERY impressive event. One general (I must stress that this is a very general observation and not based on anything scientific!) observation I made while at the show is that the collecting interests between Europeans and collectors from the United States is different. 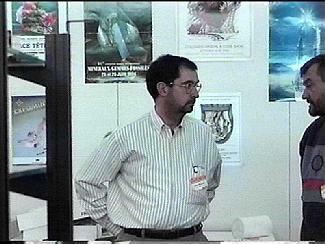 There were many more species dealers there and collectors seem to be more interested in species, localities, and associations than aesthetics. More US collectors tend to go after impressive aesthetic specimens. There is the same interest in fossils and gemstones found here in the US but, in general (see caveat above) the mineral collectors of Europe seem to place less importance on aesthetics than they do the scientific aspects of specimens. This is, of course, not universal but it is an impression I was left with. My main interest at Munich were to look for new specimens for the Rare Minerals website and also new specimens for the February Virtual Show which will feature specimens from the Kalahari mines - Hotazel, Wessels and N'Chwaning. 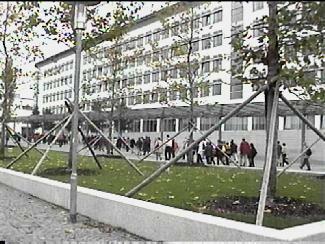 A view of the train load of people making their way to the show from the Messerstadt West stop. The Munich underground Metro system (excellent by the way!) has two stops at the old airport. One at Messerstadt Ost and Messerstadt West. On the first day I was a bit overwhelmed at the size of the converted hangers. The first impression you get is the sense that there is a hell of a lot to see. People are running all over trying to create internal maps of where dealers are or specific items of interest are. One thing that also struck me is that there is a definite community of people - collectors and dealers alike that travel all over the world as I saw many familiar faces and aquaintences. Within the first 20 minutes I ran into Andy Seibel (Andy Seibel Minerals out of Tehachapi, California) who immediately showed me where some interesting specimens were. We shot over to Hall B2 where I found some interesting Cobaltoan Calcites from Congo Minerals. They also had some excellent carrollite specimens available. 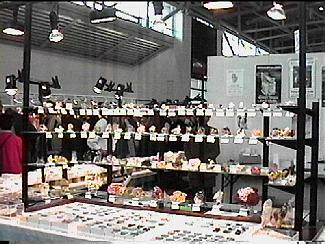 In center of the hall was Ian Bruce of Devon, England who had a very large selection of the new mimetites from Thailand. The Virtual Show featured some of these specimens during the Denver Show this past fall. 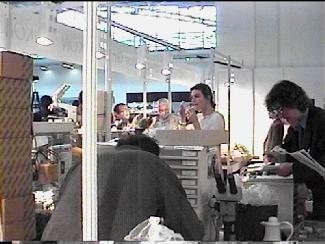 The mimetites were quite popular with virtually all of them selling out in the first day or so. 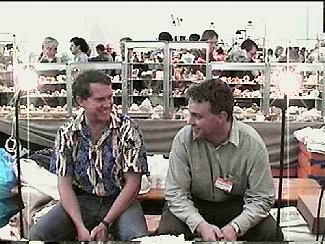 Here's a shot of Ian (on the right) discussing the finer points of mineral dealing with Scott Werskey of Reno, Nevada. Scott was headed for South Africa immediately after the Munich Show. 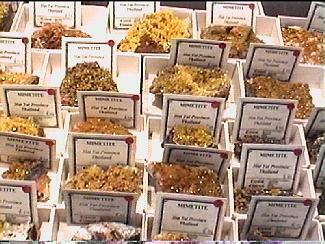 A shot of some of the mimetite inventory from Ian Bruce. Near here were several US dealers. Wayne and Donna Leicht of Kristalle were set up with their usual assortment of Eagle's Nest gold and selection of fine global specimens. I had the chance to rummage through the flats of minerals that they leave in Munich that are never shown in the US. I found some interesting items such as an English witherite, Rathite from Lengenbach, and a few others. Here's a shot of Kristalle's booth with Wayne behind the counter and Donna's back is facing the camera talking to a collector decked out in traditional alpine garb. Across from Kristalle was Bill Larson from Pala International and Coast to Coast Gems. 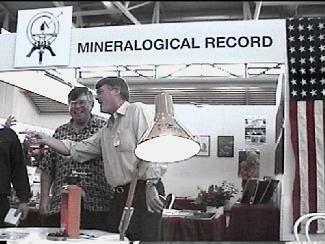 Here's a shot of Bill Larsen yucking it up with Dave Wilbur in front of the Mineralogical Record booth. I found two interesting specimens from Bill including a perfect doubly terminated Ilvaite crystal and gorgeous gem quality Heliodor crystal both from Russia. Next to Kristalle was Alfredo Petrov of Chile and a Dr. Ryuji Marumoto - Japanese dealer - who had some interesting rare species from Japan. 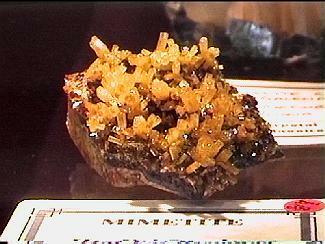 He had some micro crystals of Nambulite and also specimens of linarite from the Tsujigase Mine in Hyogo-ken, Japan. 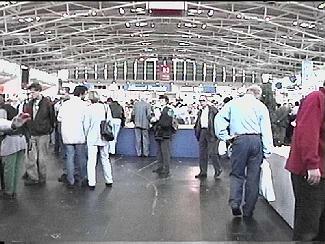 Looking down the walk way from this section you saw the Munich Show promoter's booth. Here's where Marty Zinn was seen frequently. 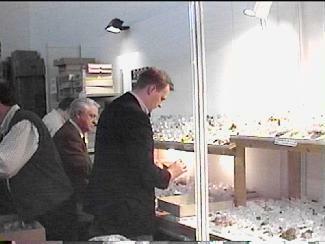 Sammlung Minerals (Christian Rewitzer) had a fantastic assortment of common and rare minerals all reasonably priced. I spent a small fortune with them obtaining some specimens of the new mineral Fluornatromicrolite and some better known rarities such as nagyagite, kolbeckite, gold from Varespatek, emmonsite and others. They also had some excellent specimens of Pakistan minerals. Jordi Fabre of Fabre Minerals had his assortment of high quality minerals including some specimens from a new find of Kongsbergite - a rare silver/mercury bearing mineral. I purchased several for my website and this show report. Here's a couple of shots of Jordi's booth and of Jordi. 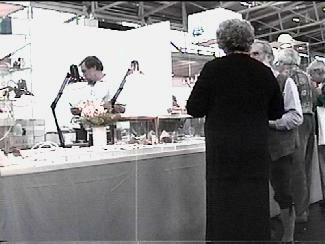 Lastly, in Hall B3 I spent some time at Gilbert Gauthier's Booth. Gilbert actually works with Congo Minerals supplying them with many of their mineral specimens. I sensed a good opportunity to obtain a wide range of rare uranium bearing minerals from Gilbert from the famous Musonoi and Shinkolobwe mines in the Democratic Republic of the Congo as well as other global localities. All are presented in my Uranium page. Over now to Hall B2. With a little stomping around and determination I was able to find lots of good specimens. 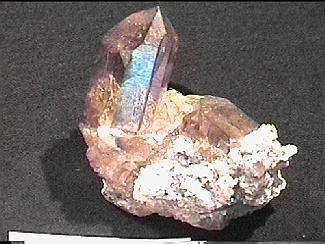 Mikon minerals had some outstanding specimens of rare species. I picked up a number of excellent specimens from the Kalahari mines for the Tucson TVS. They had scores of flats of rare species. Here's two shots from the Mikon Booth. Markus (on the right) helped me to put together a collection of excellent specimens from the Kalahari mines. They maintain a very large selection of rare minerals from African and European localities and everytime I went by their booth the place was jammed with collectors. The theme this year for the show was Twinned Crystals. As luck would have it my video camera decided that it was time to quit before I could tape most of the displays however I was able to get some pictures. The following are from the displays. 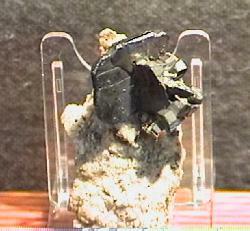 A large 1.5 inch twinned crystal of stephanite from Freiberg. 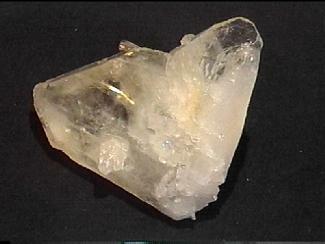 Here's a 6 inch specimen of a dauphined twinned quartz. Here's a 4 inch specimen of a Japan Law twinned quartz. 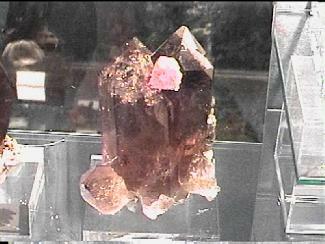 Here's a 9+ inch specimen of a two smokys with a killer 2 inch octahedron of pink fluorite from Switzerland. Here is where my video camera bit the dust unfortunately. There were dozens of cases with fabulous displays of twinned crystals of everything you could imagine - calcites, gold, pyrite, fluorite, even a sensational gem greenish brown sphalerite from Romania. Are you starting to get the picture? The equivalent of three large main Tucson Shows and only three days to see it in!! It is impossible to adequately scour the entire show and see everything. But it is certainly fun to try! This has been a cursory view of the Munich Show but one which hopefully gives you a sense of the range of material there. My little report has focused principally on minerals but there was a vast array of gemstones, fossils, spheres, lapidary, journals, displays and on and on. This was my first visit to the Munich Show and it certainly won't be my last!